Some might consider it obsolete, but Flash remains of the most frequently used technologies of Web 2.0 and Adobe continues to deliver updates with improvements, as well as security and bug fixes on a regular basis. However, the default updater of Flash Player checks for new versions of the software at long intervals. As a solution to this problem, Alternative Flash Player Auto-Updater provides a simple way of ensuring Flash Player is updated to the latest version. The application automatically checks and installs updates and in business environments, remote configuration is supported so there is no need to setup workstations individually. 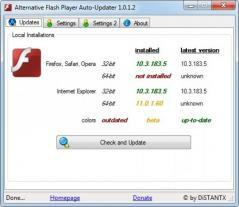 Alternative Flash Player Auto Updater can detect new Flash Player versions for the most popular web browsers such as Chrome, Internet Explorer, Mozilla Firefox, Safari, and others. Users can tweak various settings like ignoring certain updates, automated update checks at custom intervals and unattended update installation among others. - Supports all Windows editions starting with XP. - Multilingual support (English, Spanish and German). - Administrator credentials can be stored. - Option to setup global network configuration. - Can be used behind proxy servers.